Extreame Savings Item! Free Shipping Included! Save 49% on the Stackable Steamer Insert Pans, Cook 3 Dishes, Pressure Cooker Accessory 6, 8 qt by EasyShopForEveryone at Baking Love. MPN: PCIP-3T-KJ. Hurry! Limited time offer. Offer valid only while supplies last. VERSATILE: Cook 3 different foods simultaneously! Three tier stackable pans are convenient when you need to cook more than one dish at a time, or want to heat up leftovers without using the microwave (the food tastes much better). These trio multipurpose pans allow you to steam vegetables, meat, and fish; cook rice, make cakes, pasta; or use as a lasagna pan. Make cheesecake that tastes great! Great pans for doing "Pot in Pot" cooking in your Instant Pot! Also, useful to store food. TWO INTERCHANGEABLE LIDS: The stackable pressure cooker set includes two lids -- a steamer, and a sealing lid. The steamer lid is designed with holes to perfectly steam your food. The sealing lid is perfect for cooking or re-heating food. 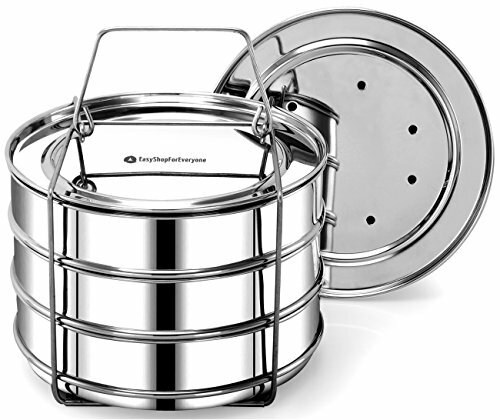 FOOD GRADE STAINLESS STEEL: The stackable steamer set is built with high-quality food-grade stainless steel. It is durable and nice heft. The stackable stainless steel steamer set is a great accessory for your Instant Pot. FITS 6 & 8 QUART COOKER : The stackable steamer set fits perfectly in 6, and 8 qt cooker such as Instant Pot IP-DUO60, IP-DUO60 V2, IP-DUO60-ENW, LUX 60 v3, IP-DUO80 and so on. It would also fit into other 6 quart and above electric pressure cookers such as Kuhn Rikon, Power XL, Cuisinart, Fagor, Costaway, Faberware, T-fal, Elite, GoWise, Secura, and Gourmia. 100% MONEY-BACK GUARANTEE: You will love this product! We have complete confidence in our product. If you are not happy for some reason, we offer you a 100 percent money-back guarantee within 30 days of purchase. Please note: This offer is valid only on the products purchased directly from us. If you have any questions about this product by EasyShopForEveryone, contact us by completing and submitting the form below. If you are looking for a specif part number, please include it with your message.